A gentle breeze blows through the surrounding fields making the grass dance. Behind me, majestic Verdala Palace emerges from Buskett woods, an old hunting ground of the Knights; and to my right, the prehistoric cart ruts, whose exact purpose remains shrouded in mystery. I walk along the rocky path, past the remains of a tomb found in the maze of the cart ruts, all the way up past the ħajt tas-sejjieħ, rubble walls that characterise the Maltese countryside and are used to separate fields, till I reach a gaping hole in the rocky ground. This is Għar il-Kbir, which literally translates as ‘Big Cave’. It is the remains of a large cave complex which locals used to inhabit before the British authorities forced them to move out in the 19th century. 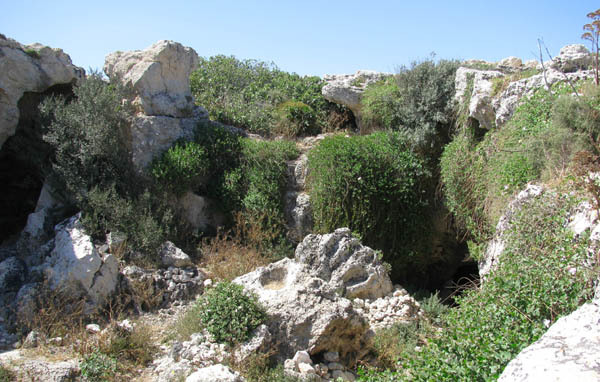 Down the Rabbit Hole: The cave complex remains of Għar il-Kbir. I start making my way down, fancying myself an adventure like Indiana Jones. On the way, I spot a small cave to the right which seems to be accessible. I crouch through the gap and the cave opens up before me. The air is cool and heavy and I can smell a hint of dust and mustiness. The sensations are magical and stir something within me; a sense that I’ve travelled back in time to when the cave was a troglodyte dwelling. The ceiling is low, and the space seems to open up into three small chambers. 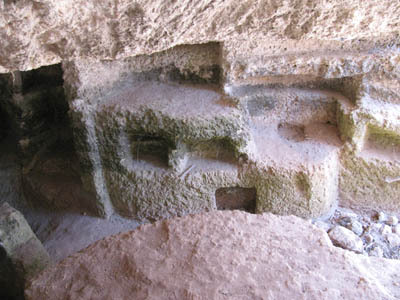 The stone has small openings and holes carved into it resembling shelves. I stare at these openings and wonder at what the previous inhabitants used to place here. The stone also offers a rich variation of colours: white, brown, yellow, grey, green and black, which give it a haunting look. I crouch down to get out of the small cave and continue along the rocky path to the bottom. Looking around, I try to picture how breathtaking this cave must have been with a ceiling if its remains are still this magnificent. On this level there are four main caves which are accessible, and each cave opening is flanked by rubble wall structures. 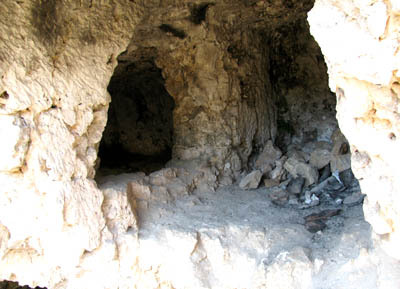 The cave on the left closest to the complex entrance has a massive chamber with a collapsed ceiling. Inside, the curious explorer can find stairs cut into the rock leading to shallow graves which inhabitants must have used as beds. The other cave on the left side leads to another chamber divided into small spaces, which were possibly different rooms in the past. Some rubble walls still stand here, showing how the space was partitioned. I could sense still the presence of the people who lived here because of what they left behind; the cave itself is a living memory. The caves on the right are sectioned next to one another. They lead to a huge chamber, divided through the middle by rock walls. Inside this chamber, it’s dark and the air is heavier, as if you were inhaling the darkness itself. To the side there’s a slope which you can climb up. At the top, I duck past some branches to reach the outside area which is basically a higher position overlooking the outdoor floor where you can access the four caves; it would have acted as a sort of balcony overlooking a historical courtyard. What saddened me, however, is the amount of garbage I found in this magnificent cave. I found several old disposable barbecues littering the floors of the caves along with plastic bottles and food wrappers. Old gun cartridges, fired by hunters who shoot in the vicinity, were discarded on the floor. I wonder how those ancestoral cave folk would have felt if they saw their ‘homes’ in this sorry state today. Unfortunately, Għar il-Kbir is not the only historical treasure to be desecrated by litterbugs. Binġemma catacombs have also suffered a similar fate. Close to the Binġemma catacombs (limits of Rabat) rests the Victoria Lines – the towering wall built by the British to act as a land defence on a natural fault line separating Malta’s North and South. The catacombs, which are built into the cliff side, date back to the Stone Age and Roman times. These tombs are quiet and have that evocative feel of a sacred burial ground. They are mysterious and excite anyone willing to venture into them to learn their untold secrets. Like in Għar il-Kbir, it is both beautiful and mystifying but it also was adorned with disposable barbecues and plastic bottles, all which act as a reminder that certain people do not care for the riches they have. There is no watchman present who looks after these treasures of our heritage. With no one to provide security for these caves, they will constantly be used as dumping grounds by people who do not understand or care for their value. Precious gifts like these should be preserved and safe guarded and not left to waste, forgotten and forlorn. We should offer them respect and protection, and not our undesirable waste. Marc Buhagiar is an MA student of English and the Media at the University of Malta. He researched and wrote this article for an assignment on blogging.